String Theory 8 / EA Bucket 14: 29 Quartets, etc. Gabriel PROKOFIEV: String Quartet No. 1 (2003). Var. comps, var. remixes. The Elysian Quartet: Emma Smith, Jennymay Logan (vlns), Vince Sipprell (vla), Laura Moody (vlc). Nonclassical NONCLSSCD001 (1 CD) (http://www.nonclassical.co.uk/). Distributed in the US by Naxos (http://www.naxos.com/). Gabriel PROKOFIEV: String Quartet No. 2 (2006). Var. comps, var. remixes. The Elysian Quartet: Emma Smith, Jennymay Logan (vlns), Vince Sipprell (vla), Laura Moody (vlc). Nonclassical NONCLSSCD003 (1 CD) (http://www.nonclassical.co.uk/). Distributed in the US by Naxos (http://www.naxos.com/). Prokofiev’s awkward First provides fodder for insipid remixes. The Elysian dutifully sandblast through four wee movements. Omitting the original quartet would have created some mystery, but no, we have various homunculi loitering about a carcass. With the more idiomatic Second, the Elysian step beyond scouring. There are now eight remixes instead of the First’s five, and maybe it’s the improved original material, but this batch interests. More loops without pounding beats, overall more subtlety. Has the genre improved so quickly? At this evolutionary rate, Prokofiev’s 2010 Third should be interesting. “getString.” Jens VOIGT-LUND: Circuitous, Mountains (1999). 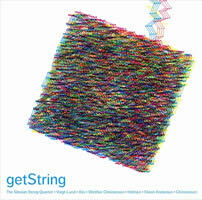 Morten RIIS: getString (2008); fromString (2009); useString (2009); toString (2009); quitString (2009). Christian WINTHER CHRISTENSEN: String Quartet (2002-03). Jexper HOLMEN: Intend/Ascend (2000-02). Simon STEEN-ANDERSEN: String Quartet (1999). Simon CHRISTENSEN: Towards Nothingness (2008). Silesian String Quartet: Szymon Krzeszowiec, Arkadiusz Kubica (vlns), Łukasz Syrnicki (vla), Piotr Janosik (vlc). Dacapo 8.226530 (1 CD) (http://www.dacapo-records.dk/). Distributed in the US by Naxos (http://www.naxos.com/). According to the notes, these Danish composers hold Lachenmann in high regard; however, we ought to look beyond the abrasive vocabulary. For example, the startling oscillation between open strings and strident octaves in Holmen’s Intend/Ascend arrives at a tonal melody with accompaniment, the full 16 strings simulating an electric guitar. Christensen’s Towards Nothingness imitates folkish ostinatos and patterns. All five quartets hover around the nine-minute mark — could these techniques sustain longer durations? Not unlike bagatelles, Riis’ bitty remixes, too brief to annoy, follow each quartet. It’s not evident that he’s using the previous work as source. 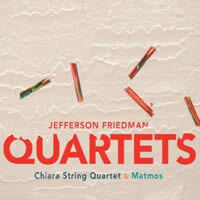 Jefferson FRIEDMAN: String Quartet No. 2 (1999); String Quartet No. 3 (2005). MATMOS: Remix No. 1, “A Bruit Secret Mix” (2011); Remix No. 2, “Floor Plan Mix” (2011). Chiara String Quartet: Rebecca Fischer, Julie Yoon (vlns), Jonah Sirota (vla), Gregory Beaver (vlc). New Amsterdam Records NWAM030 (1 CD) (http://www.newamsterdamrecords.com/). Distributed in the US by Naxos (http://www.naxos.com/). Performed by their dedicatees, Friedman’s Second and Third reveal a taste for form and substance. The Chiara engage with energy and bustle, but square rhythms and default transitions suggest an unwillingness to bulldoze constraints. A brief note explains that both quartets are diary entries. I am put in mind of Shostakovich absent the emotions. Each quartet requires three movements. The Third profits from asymmetry (2:27, 17:35 and 5:57). I am surprised this got a Grammy nod, but then again, that contest’s results forever amaze. The thumping beat in Matmos’ Remix No. 1 soured whatever positive feelings I may have had about the preceding Second. Fortunately Remix No. 2 loops and splices without percussive kicks to provide a more apt coda to Friedman’s Third. 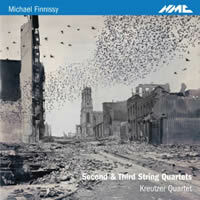 Michael FINNISSY: Second String Quartet (2006-07); Third String Quartet (2007-09). Kreutzer Quartet: Peter Sheppard Skærved, Mihailo Trandafilovski (vlns), Morgan Goff (vla), Neil Heyde (vlc). NMC Records NMC D180 (1 CD) (http://www.nmcrec.co.uk/). Distributed in the US by Naxos (http://www.naxos.com/). Opening with a swift kick to the shins, Finnissy’s aggressively dissonant Second could be mistaken for Carter. The music soon becomes barren, with further episodes including a waltz suggesting larger concerns about structure and memory. Just before the midpoint, the pulse slackens with glacial glissandos until assertive violins return. A scant 20 minutes, the Second is a perplexing asymmetrical statement, compared to the nearly 45-minute Third, the contrasts of which fuse into a single perspective. A tape releases birds into the ensemble, the strings’ masked bits having emulated Haydn throughout. Finnissy eventually achieves elegant magic: On reaching the double bar, it is the musicians who sound foreign. 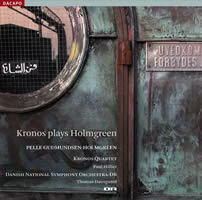 “Kronos plays Holmgreen.” Pelle GUDMUNDSEN-HOLMGREEN: Concerto Grosso (1990, rev. 2006)1; Moving Still (2004)2; Last Ground (2006)3. Kronos Quartet1, 2, 3: David Harrington, John Sherba (vlns), Hank Dutt (vla), Jeffrey Zeigler (vlc); Paul Hillier2 (bar); Danish National Symphony Orchestra / DR1, Thomas Dausgaard (cond.). Dacapo 6.220548 (1 SACD) (http://www.dacapo-records.dk/). Distributed in the US by Naxos (http://www.naxos.com/). The 30-minute Concerto Grosso shuttles quartet and percussion-rich orchestra across a shifting landscape. Maybe there’s a story. Gudmundsen-Holmgreen suggests “Vivaldi on safari,” and admits the work meanders and stalls. This recording updates a prior version captured on Dacapo 8.224060. Two Hans Christian Andersen texts appear in Moving Still — H.C. Andersen 200, the first in English, the second in Danish. Given that expat Hillier is now fluent in Danish, he excels in both parts, adding an ironic outsider perspective to the Nationalist texts. “In A Thousand Years” presciently imagines a world where young Americans fly across the ocean to visit old Europe. This American first movement contains taped vocal effects that emphasize the music’s agitation. The Danish movement comprises a set of variations on “In Denmark I Was Born,” using a lovely traditional melody. Jazz and Eastern flavors wander in and out to question Danish identity. Last Ground incorporates ocean noises. The string quartet emerges from pounding surf only to drown under electronically manipulated sea sounds. 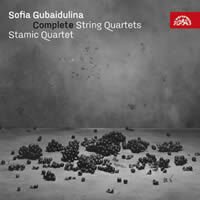 Sofia GUBAIDULINA: String Quartet No. 1 (1971); String Quartet No. 2 (1987); String Quartet No. 3 (1987); String Quartet No. 4 (1993); Reflections on the Theme B-A-C-H (2002). Stamic Quartet: Jindřich Pazdera, Josef Kekula (vlns), Jan Pĕruška (vla), Petr Hejný (vlc). Supraphon SU 4078-2 (1 CD) (http://www.supraphon.com/). Distributed in the US by Qualiton (http://www.qualiton.com/). Five quartets spanning four decades imply a progression. Given Gubaidulina’s independent spirit, any such evolution is obscured. These single-movement inscrutables do not yield easily, despite the Stamic’s profound advocacy. Any recording of the 21-minute First hides its theatre: The players eventually drift into separate corners to deliver their final pages autonomously. The Second and Third appeared in 1987 as the result of two commissions, though the latter doubles its contemporary’s length at 18 minutes. No. 2 opens with microtones and glissandos somewhat like Scelsi absent the exotic longings. A repeating cadence strives to achieve its purpose. Pizzicato pervades No. 3’s first half. After bows appear, the music grows insistent, hinting at late Beethoven. The Fourth requires tape, or if possible, two additional quartets, one tuned a quarter-tone lower. The Stamic made their own tapes, one requiring bouncing balls against the strings. As with the First, an audio recording fails to convey the composer’s extramusical effects, in this case a light show. The B-A-C-H motive appears in other quartets, somewhat distinctly in Nos. 2 and 3, and only after several labored minutes does it emerge in Reflections. Gubaidulina’s music is about transformation, usually emotional, and this most recent quartet more easily reveals her preferred mechanics. 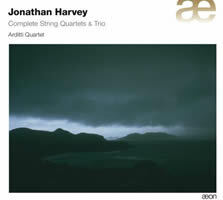 Jonathan HARVEY: String Quartet No. 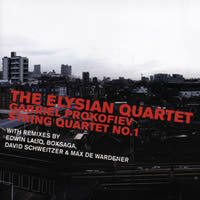 1 (1977); String Quartet No. 2 (1988); String Quartet No. 3 (1995); String Quartet No. 4 (2003); String Trio (2004). Arditti Quartet: Irvine Arditti, Ashot Sarkissjan (vlns), Ralf Ehlers (vla), Lucas Fels (vlc). Aeon AECD 0975 (2 SACDs) (http://www.outhere-music.com/aeon). Distributed in the US by Allegro Music (http://www.allegro-music.com/). The First emerges from the ether, one pitch gradually blooming into complexity across ruptured unisons. Harmony and traditional structures are not important here. Incorporating filigree, No. 2 hides Schoenbergian gestures and extends No. 1’s concepts if not its explicit material. The Third increases activity which appears to better satisfy the Ardittis. These three contract in duration from 18 to 16 to 14 minutes, following no easily graspable structure. Spanning 18 years, they bespeak a gradual awakening. Far more substantial, even traditional, the 31:42 Fourth requires live electronics which repeat and transform the quartet’s live offerings. Like the First, which starts from nothing, the Fourth slowly gains consciousness, its feathery gestures, manipulated electronically, spreading like dew. The brash Trio opens with instruments retuning. Violin and viola launch into unsynchronized folk-like streams over cello-body thumping. Even though the first three quartets succeed as a cycle, the more alert second disc with the Trio and Quartet No. 4 makes a better program. Rafał AUGUSTYN: String Quartet No. 1 (1972-73, rev. 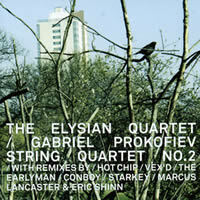 2009); String Quartet No. 2 with flute (1980-81)*; Dedication (1979-1984)†; Do ut des (1998); Quartet No. 2 ½ with electronics, “Grand jeté” (1995, rev. 2005). Silesian String Quartet: Szymon Krzeszowiec, Arkadiusz Kubica (vlns), Łukasz Syrnicki (vla), Piotr Janosik (vlc); Agata Zubel† (sop), Jan Krzezowiec* (fl), Rafał Augustyn (electronics). CD Accord ACD 165-2 (1 SACD) (http://www.cdaccord.com.pl/). Distributed in the US by Naxos (http://www.naxos.com/). I’m surprised at not having encountered Augustyn till now. Clearly, he hasn’t punched through the Polish border as well as his teacher Górecki. The aggressive and spunky three-movement First suggests that Augustyn enjoys working through tight pitch collections and their implications. It could be serial except that its dynamism suggests a composer who flouts rules. The monolithic Second takes a different tack. Oppressive held chords smother the first half and a climax introduces a flute slyly doubling an oscillating accompaniment. The flute reappears at the end to drizzle short notes over sustained strings. Opening with extensive pizzicato, Dedication adds a soprano to sing Apollinaire bits. The trifling Do ut des’ title can mean both “I give so that you may give” and the pitches C, C and D-flat. Quartet 2.5 was first a film score that can be performed live, as here. Occasionally concrète shutter clicks and birds occur at the edges, in others the quartet interrupts the tape, at one moment taking up some Beethoven. 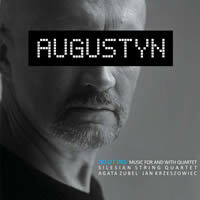 Stylistically, the fluid music is expressive, thus different from the other Augustyn works. The film is about the dancer Wojciech Wiesiołłowski. I’m guessing it’s his voice which we hear now and again. “American Music.” Steve REICH: Different Trains (1988). Samuel BARBER: String Quartet, Op. 11 (1936). George CRUMB: Black Angels (“Images I”) (1970). Quatuor Diotima: Yun-Peng Zhao, Naaman Sluchin (vlns), Franck Chevalier (vla), Pierre Morlet (vlc). Naïve V 5272 (1 CD) (http://www.naive.fr/). Distributed in the US by Naxos (http://www.naxos.com/). Reich’s work for quartet and tape contemplates train rides between 1939 and 1942. In America he shuttled between separated parents; had he been in Europe, as a Jew, he would have been on very different trains, hence the title. Spoken words relate stories of Holocaust survivors and Pullman porters. Reich has the quartet mimic the voices’ lilt as phrases are looped. Over the years, Reich’s quartet has become a storytelling classic. Barber’s Quartet couldn’t be more different. Drab, unfamiliar movements surround the iconic Adagio Barber would never live down. A reaction to the war in Vietnam, Crumb’s quartet asks for amplification. Indeed the strings are perpetually distorted. We also hear the performers playing water glasses and assorted percussion. 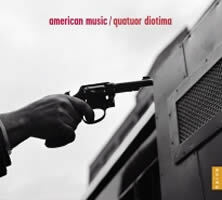 We’ve met the Diotima playing Nono, Lachenmann and Posadas, all of whom serve this American music like older European brothers.